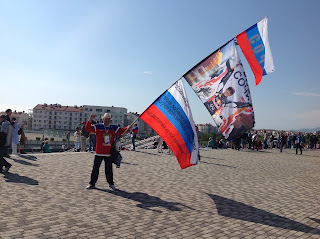 Talking about F1: The F1 blog: Russian GP Betting - Migrate back to Mercedes? May you live in interesting times. Such a phrase is usually said ironically; reckoned as it is to be a Chinese curse. But for the gambler interesting times can be a blessing. By Липунов Г.А. - Own work, CC0, https://commons. Of course there are many opportunities for online betting these days – there are a variety of sports you can take a punt on the outcome of, as well as online poker, real money casino sites and many other things. But you could make the case that right now it's the F1 fan who wants to put his money where their mouth is that has the most potential joy. F1 in 2017 is indeed living in interesting times – with a surprisingly competitive season featuring a surprisingly strong challenge from Sebastian Vettel and Ferrari. And perhaps it all has increased the opportunities to make hay. And conversely for the Russian Grand Prix in Sochi taking place this weekend this all may have added to the value of backing Mercedes to bounce back; you can back Lewis Hamilton to bag the Sochi win at a relatively long even money. There's a rationale behind it too. Unlike Bahrain last time out when Seb and Ferrari won for the second time this campaign, Sochi may be Merc territory. Tyre wear and degradation is traditionally low here, as are the ambient temperatures, which not only may take away some of Ferrari's tyre longevity trump card it may also give the red cars a problem getting their Pirellis 'into the zone'. And Merc might have won in Bahrain anyway without treading variously on its own tail. Mercedes getting on pole is a safer bet; it's got all of them this year so far and with some comfort. Lewis can be backed at 11/17 for pole position in Russia. The bigger question may be which Mercedes takes it and indeed the 'other' Merc of Valtteri Bottas got pole in Bahrain (albeit aided by a sub-standard Lewis lap). Bottas has a good record at this track – in each visit he's qualified third (in a Williams...) and might have got pole in 2014 without an error. With all of this, his odds to repeat his Bahrain feat by bagging pole in Russia at 7/2 look generous. And if you fancy a safer punt on Valtteri, you can get 1/2 on him to finish in the top three this time. Given the above considerations, the general lay of 2017 competitiveness, as well as the way Kimi Raikkonen has been going lately, that's a minimum expectation for Valtteri with a trouble free run. The Red Bulls have struggled to get the soft tyres to work this season as they don't have the downforce required to warm them up. But in Sochi it can avoid the soft and run the ultrasoft and supersoft if it prefers. In Bahrain the Bulls ran with the leaders until having to bolt the softs on – and you can back Daniel Ricciardo at 9/2 or Max Verstappen at 7/2 to finish on the podium in Russia. Williams as intimated has a good record here – reflecting that 70% of the lap is at full throttle at the Grove car is strong in a straight line – and you can get 4/7 on Felipe Massa to finish in the top six. If you fancy a cheekier punt, then the other Williams of Lance Stroll can be backed to do the same at a whole 9/1.